I use "private" categories for many different purposes. Recently, I had occasion to remove several users from one of these categories and found that I could only do so individually via the "Users" setting which is slow and inefficient when dealing with more than one user. 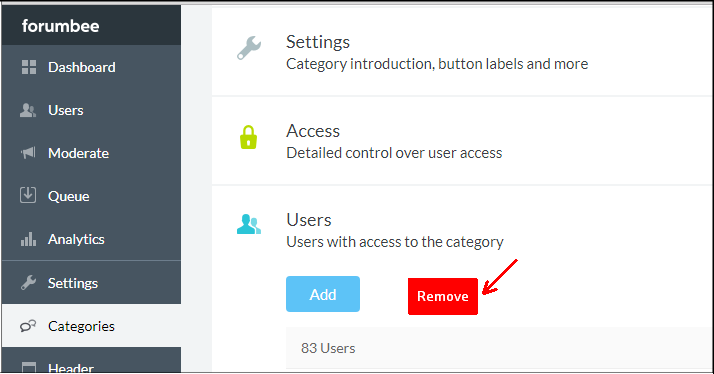 My suggestion is to add a "Remove" users capability to the "Categories" setting which would work similar to the "Add" users capability. Clicking the suggested <Remove> button will display a dialog for me to enter user email addresses for removal. After entering all email addresses targeted for removal, clicking the <Save> button would remove the targeted users. Hi Neil , thanks for sharing your feedback! This is a great idea for a way to manage a bulk remove. We will take this into consideration.